You would think my life’s a movie. I leave my job at Florida Dream Homes and jump on I-4 for the hour long commute to the FFF. I’m on the highway for roughly ten miles and pull up behind a motorcycle cop. Obviously I don’t speed past the cop because clearly that wouldn’t be smart. Traffic is merging onto the highway near The Mall of Millennia, so instead of speeding up, I hit my brakes to allow an oncoming vehicle to merge. The cop slows down, pulls behind me, and then pulls me over. 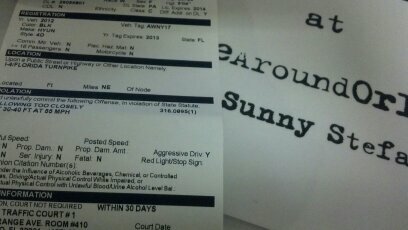 You, like myself, may be thinking, “what did SunnyStefani get pulled over for?” I ask the cop that same question. He says, “State Statute 316.0895(1).” I give him a blank stare. “Following too closely,” he says. It would have been better if he reached inside my passenger side window and smacked me across the face. Who gets pulled over for ‘following too closely,’ really! $164 later, I arrive at the FFF. I don’t know why I plan to see specific movies because my plans always change and I never see what I intended to. Tonight I planned on seeing Bert Stern: Original Madman. My little run in with the police officer who was saving the world from drivers ‘following too closely’ made me miss my show time of 3:30 pm so I decided to see Shorts #4: “Can I Get a Witness?” This is my first set of short programs I’ve seen both years at the festival. This was my absolute favorite short of the series because it suits my dark sense of humor. This 19 minute short was about a junkie who tries to kill himself until he receives a call from his sister who he hasn’t spoken to in years. She needs him to watch her 9 year old daughter, Sophia. This film had a great score, an amazing dance number and outstanding actors. I loved it and couldn’t wait for the Q & A session after with director, Shawn Christensen. You would think spending $100 million on advertising would work, right? This film is about someone looking to ‘own’ the color ‘red.’ When it didn’t work, the client slit his wrist. As the bathtub filled with blood, seeing red, the client is reminded of a red colored soft drink can. He thinks, “Why didn’t I work for Coca-Cola?” Short, to the point. Overall, okay. Didn’t love it, didn’t hate it. Benny the Bunny was stolen from his home. When his owner, a young boy, goes looking for him through the slums, he finds him. Turns out, the school bully stole him. The film shows kids trying to do a good deed, and in that aspect, I liked the film. This sick comedy was about a therapy session in which Dan expresses the trauma he experienced as a child. At first it was serious, then funny, then predictable. This sad yet motivational film was about a female wrestler, Monique, who wants to prove to her father and classmates she has what it takes. I felt happy and sad numerous times throughout this film but overall there was no resolution. This was my second favorite short of the night probably because the main character got pulled over by a cop for going 21 mph in a 40 mph minimum speed zone. This film featured Monty the Moose who is an actor who performs at kids’ birthday parties, singing and playing the guitar. Cute concept, good music and I was pleased to see that it was directed by a female. It’s great that the film industry is becoming more accessible to us females! This creepy short is about a lonely old man, Mobius, who works as a hotel receptionist. He writes down all the guests’ information and lives vicariously through them. He’s excited to get fired because that means that someone noticed him. I’m not a fan of the voice over this film used or the fact that is seemed like Mobius was stalking guests. Creepy. I wanted to like this film, but it was my least favorite of all the shorts I saw tonight. This film was about the space shuttle launch of Atlantis on July 8, 2011 that ended the shuttle program. It was a documentary with a love twist, that just didn’t do much for me. 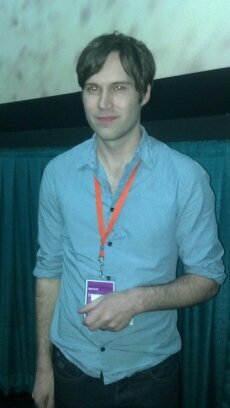 Matthew Ornstein, the director, was present for the Q & A session as well. I was excited to get to talk to Shawn since Curfew was my favorite short of the night. During the group Q & A, Shawn stated he has “a really dark sense of humor,” which I can relate to. The film had a wide range of emotions with stemmed from Shawn’s “intimate relationship to depression.” After the film, I stayed to talk to Shawn. I asked him what his inspiration for the film was in which he replied “after a massive depression and breaking up with my girlfriend.” I guess directors and singers both get their inspiration from life experiences. Shawn said this is the “second short film anyone has seen;” however, he has another short hidden away that he wasn’t happy with after editing. After my interview with Shawn, I ran into Christine Hoefing. She is from Atlanta, GA, here to visit her brother and attend the FFF. When I asked if I could interview her, she was quick to say, “You don’t want to interview me, I tend to be hyper critical.” Christine said Bunny had “such an impact and moral statement in a kind way” and that they expressed “maturity even through children.” She said, “I think I got the message about advertising in Red” and that you’re “drawn into advertising sublimity.” “Mobius was very dark to me,” said Christine. “It was the most depressing one I saw.” “Curfew was very good” and “I loved Atlantis,” she continued. “My dad worked on the space program.” She was shocked they discontinued the space program and compared it to taking down the Statue of Liberty. Clearly everyone has different taste as the film Christine liked the most was my least favorite. Overall, I was quite impressed with Shorts #4: “Can I Get a Witness?” I’m glad I got the see them. And remember…don’t follow too closely! This entry was posted on April 19, 2012 at 3:18 pm and is filed under Art Community. You can follow any responses to this entry through the RSS 2.0 feed. You can leave a response, or trackback from your own site.